When doing promotions the ability to catch customer attention is vital. 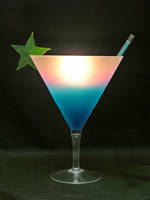 For the food and beverage industry a light up cocktail lamp may serve as a great promotional product to meet these needs. Lamps can often serve as great promotional tools as they can be made into different shapes and sizes. They give out a variety of lighting to reflect mood which promoters want customers to convey. Therefore the cocktail lamp can not only catch consumers attention with its lighting, but may also influence to try another type of drink. Customize them into a variety of shapes; from beer mugs to martinis. Print your desired logo onto the lamp to gain advertising and marketing advantages. As a promotional tool the cocktail lamp is best used at bars or restaurants. Alternatively, use them as a gift with purchase or as an on pack gift with drinks to help encourage sales.